Dots of bright baby squids float through the sea in the incredible video below from Brent Hoff on Vimeo. The video was taken back in 2002 in California's Monterey Bay Canyon with a remotely operated submarine operated by researchers at the Monterey Bay Aquarium Research Institute (MBARI), but it's making the rounds of the internet again this week with Hoff's haunting Vimeo video. The video was the first to show the awesome behaviors that some squid adopt to protect their thousands of eggs. 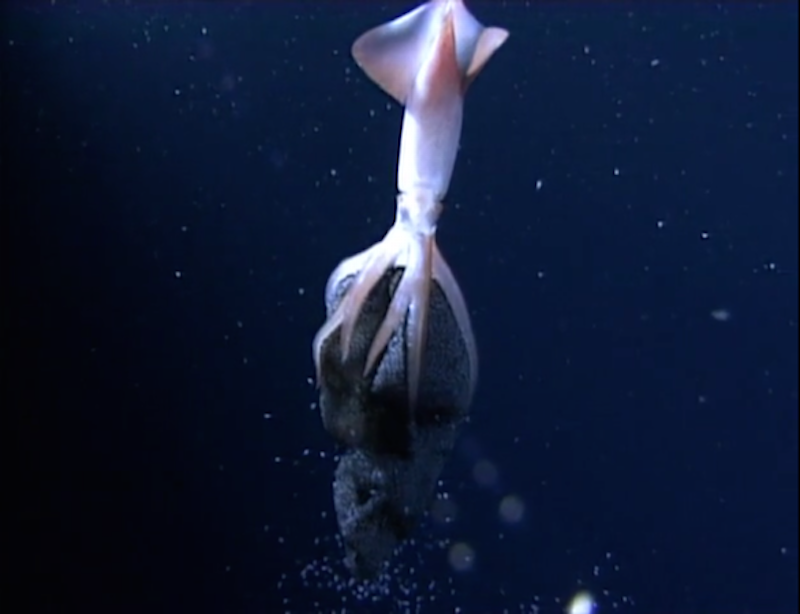 Instead of letting its unhatched eggs float out free into the ocean, the squid, Gonatus onyx, holds them close in a cone-like shape between its arms. This brooding behavior was reported in the journal Nature in 2005 by MBARI researchers. In the last few years researchers have found two other species of squid also show this unique behavior, as well, the Gonatus madokaiand the Bathyteuthis berryi. Researchers did find a similar sheet of eggs belonging to a fourth species of squid, Gonatus fabricii. But since no one has seen it actually holding its eggs, the official number of brooding squids is three. The eggs are actually held in a shimmering membranous tube that undulates regularly as the mom pumps water through it to provide oxygen to her eggs. Since the squid live pretty deep in the ocean, about 1 to 1.5 miles down, where there's less oxygen in the water, the pumping motion keeps the eggs healthy. While the baby squids in the gif above look like they are glowing, they actually aren't bioluminescent, Steven Haddock, a squid researcher at MBARI, told Business Insider in an email. They only look like they are glowing because of the lights from the submarine. The amount of care these squid mothers give to their eggs is impressive -- and much riskier than letting their babies float free. The eggs get in the way of these squids' ability to evade predators with nimble escape patterns and quick bursts of speed — their arms are busy clasping their brood, instead. They stay that way for up to 9 months, before releasing their babies into the dark ocean. Check out the full video, taken by MBARI and set to music by Hoff on Vimeo. The mother squid doesn't come into view until about 3:00 minutes in, so jump forward if you want. Check out the video below of an octopus carrying a coconut!